Did she bring enough for everyone? A slightly exaggerated rendition of both effect and capacity, but a neat movie fragment nonetheless. This entry was posted in ammunition, self-defense, weapon and tagged 45ACP, Auto Ordnance, SMG, submachine gun, THompson. Bookmark the permalink. 11 Responses to What’s in the tin? 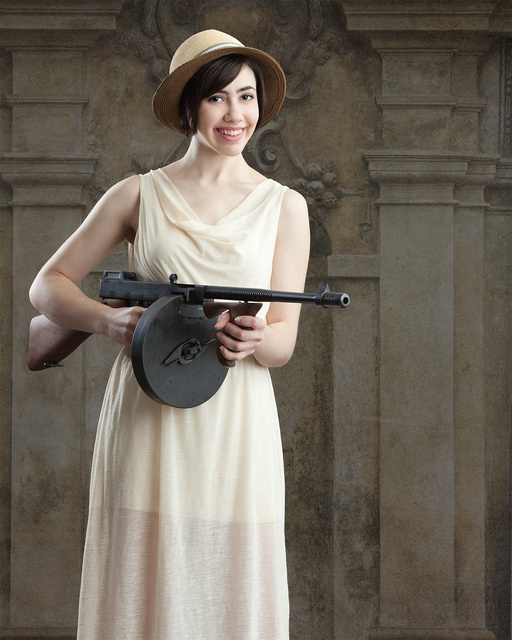 The Thompson was the Iconic “gangster gun”. But in fact most of the motorized bandits chose the BAR over the Thompson or the 1911 as the .45ACP wouldn’t penetrate the 8Ga. steel body on the Ford V8 making it less than a world beater for bank jobs. 8 Ga. is around .16″ and would be extremely heavy and extremely difficult and impractical to form into body panels. I’ve seen plenty of old wrecks, rusting in yards and fields, and none that I’ve seen were near that thick. More like 18 to 20 Ga. I should think, and easy enough to shoot through with common pistol calibers. Also; the lower tech of the 1920s would have made thinner sheet metal more preferable, from the fabricators’ perspective. The engines didn’t have the power output that later OHV engines had. Weight would be an issue there too, also favoring thinner metal. And how long does it take to reload this magazine? Watch the muzzle flashes in the scene where our hero(?) is standing in the street shooting at the car. All the flashes from his Thompson are identical, and all the flashes from the vehicle are identical. They were added digitally; the guns are not being fired. I noticed it when I watched the movie the first time, and it still bugs me. After all that shooting (500-round drum, right?) I’d have had him light the cigar on Tommy’s barrel. 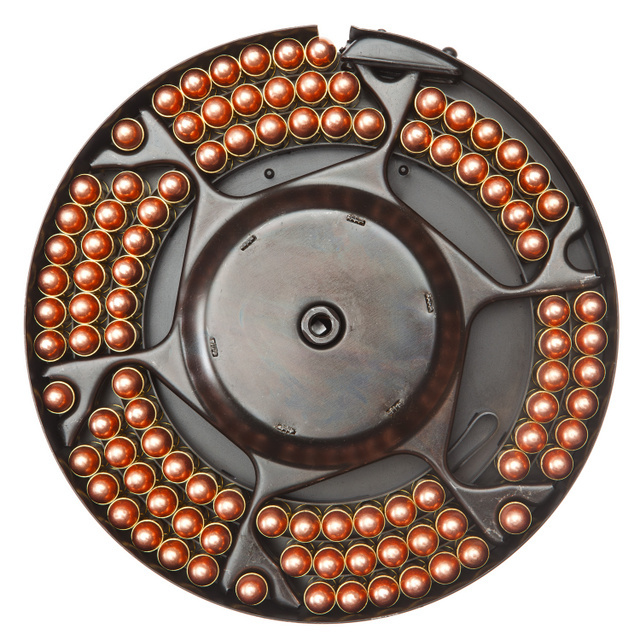 They were either a 50-round drum (most common and manageable) or a 100-round drum like the one in the photo. The 100-round version is a bear to move around, especially when loaded and in a rifle that is no lightweight to begin with. I wouldn’t mind having one of the 100-rounders just to have it, but the 50-round with mine is all I would care to lug around if it were going far. The 100-round versions WERE good for stationary positions like guard posts, etc. from what I have been told. And the special 500-round “silver-screen” drum is easy to carry anywhere. A 100 round drum has something for most every bad guy, but was a real bear to carry! Yeah, that 100 rounder looks like an unwieldy pig. But fun. Yes, the 100 round drum was enough. A 500 round version would wind up with a crew served submachine gun.